Clients benefit greatly from our balanced approach between the cost-savings of partnered outsourcing and our extensive customization. We get to know your requirements and goals to provide a cost-effective learning solution that’s not “canned” or one-size-fits-all. You also won't get saddled with "consulting fees" for reinventing the wheel. 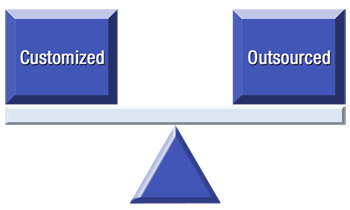 We draw from our existing resources for customization. We take the time to align with your business goals, learn your culture, values and “language” to create courses that participants experience as seamless, internal training, yet reap the value of our vast multi-industry experience and depth of content. We closely partner with you to maximize the personal touch of internal training and have worked side-by-side this way with clients for many years. We also successfully provide content with commonality across multiple business units and locations nationwide. As needed, we draw upon the talents of a select group of instructors and remain agile and able to respond to your varied needs. We offer certification of your internal trainers to deliver our proven, customized topics and will team up to work as a subcontractor with other training organizations providing opportunities to license and utilize our content – sometimes called “co-sourcing”.